While night-hunting for Ground Beetles down at the Devils Spittleful in Kidderminster I was given a really unique insight into some unusual behaviour by our two native Violet Ground Beetles, namely Carabus violaceus and Carabus problematicus. Both species are adaptable to open as well as woodland habitats, but what I didn’t realise was that both species are partially arboreal, spending quite a bit of their time in trees. It may have been a rather naïve assumption by myself at the time, but I had always had the impression that these two large, flightless Ground Beetle species were strictly ground specialists, hence the name ground of the beetle group. But I got a surprise when I went looking for them at night with a headband torch. I soon began to realise that both these species are adept at climbing trees. Tree Slugs Limax marginatus seemed to be the preferred food item, the beetle having to hold its prey high in the air in order to make its way laboriously back down to ground level. But they are generalist predators and I also saw them with caterpillars, sawfly larvae, moths and even snake millipedes on occasion. They also tolerate each other’s presence on the same tree. I would sometimes find up to four individual beetles together investigating the same small patch of decaying wood, or find two feeding on the same food item, but never have I seen any aggression shown towards each other, which surprised me as well. However, the most curious behaviour I observed happened in July and August when the sap-runs on the older oak trees came into their own. 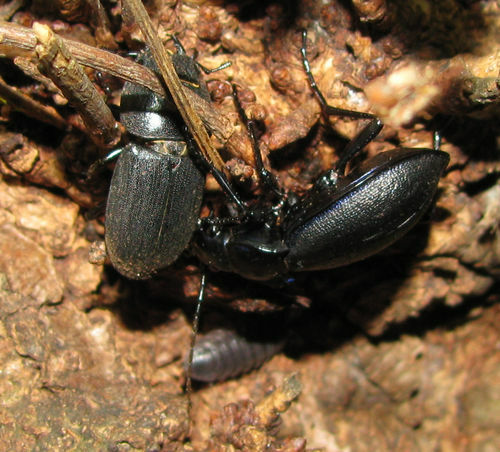 These sap-runs attract a number of insect species: moths, sap beetles and Lesser Stag Beetles Dorcas parallelipipedus. To my surprise I would regularly see Violet Ground Beetles gorging themselves on these same sap-runs until their abdomens became totally distended. They showed no interest in the moths or other insects feeding alongside them except to jostle for position with them for access. 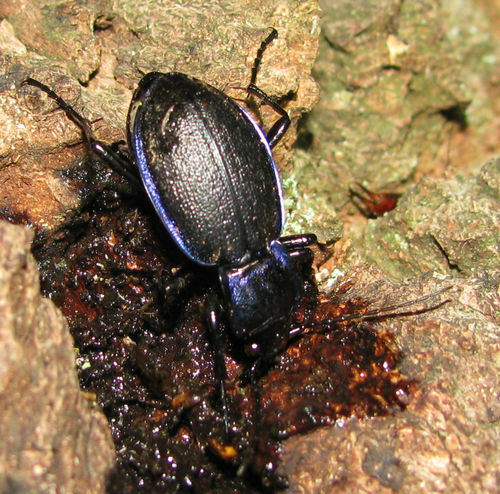 It was also noted that none of the other ground beetle species, especially the more arboreal Dromius or Spilotus types, took an interest in these same sap-runs. 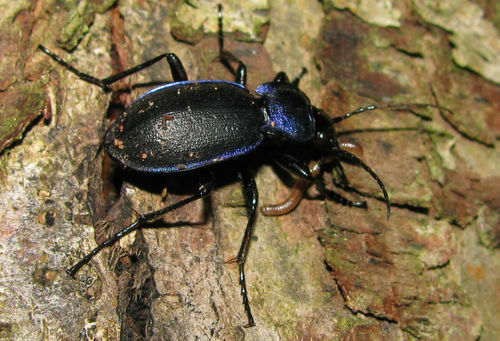 I met with the same scenario every time I went down there and observed this behaviour with both Carabus violaceus and Carabus problematicus and this wasn’t the only type of “nectar” source they used. I have also seen them tucking into over-ripe blackberries on the ground and chewing on developing leaf buds as well. Four oak sap-runs were kept under observation, each about five or six feet from the ground. Three of them were in the wooded area that surrounds the heath and the forth on an isolated oak on the heath itself. In both habitats Carabus problematicus was the most numerous Carabus species seen, with both Carabus violaceus and Cychrus caraboides being present in low numbers. In the spring large numbers of Carabus nemoralis can also be found on the grassland areas of the heath, but sightings of this species usually tail off by July when the sap-runs come into their own. Although the vast majority of Violet Ground Beetles sightings throughout the year at the site were made on the ground, I continued to find individuals scaling the trees, sometimes up to twenty feet from the ground, looking for prey. What I did notice was that their sharp tarsal claws are especially suited for gripping onto the bark of trees and it is not easy to dislodge them once they have a good grip. This activity probably does make them particularly vulnerable to owls, as they are to some extent exposed. Of course I am only commenting on woodland behaviour and these two species of Violet Ground Beetle. They can survive just as well in gardens without sap-runs and without trees, which just goes to show how adaptable they are. At least in part sap-runs do seem to provide an extra food resource at the Devils Spittleful and also provide a unique insight into the behaviour of these two species. 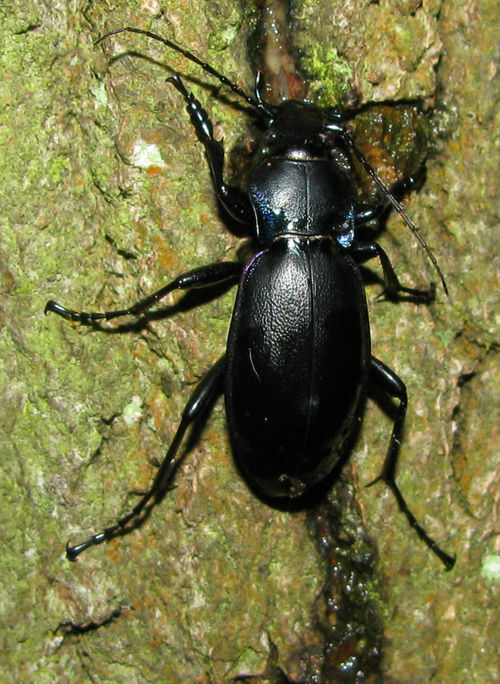 Although one photograph (1) shows Carabus problematicus jostling for position on a small sap seepage on an oak with a Lesser Stag Beetle, it is important to stress that no biting occurred even though this jostling went on for some time. A bite from a Lesser Stag Beetle is well capable of piercing the ground beetles armour however, so perhaps the ground beetle was putting itself in some danger here? Two other photographs (2 & 3) show a Carabus problematicus and Carabus violaceus at sap-runs about six feet from the ground. It usually took about half-an-hour for each one to ingest enough sap before its abdomen was totally distended and it decided that it had had enough. The last photograph (4) shows a Carabus problematicus on its way down a birch tree with a snake millipede (species unknown), extracted from the fissure shown on the left, six feet from the ground.